Hurricane Joaquin's expected track. Image courtesy of the National Weather Service. 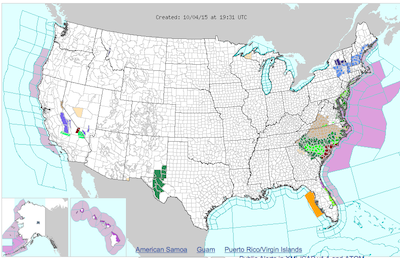 NEW JERSEY – Though the current track of Hurricane Joaquin is slated to cause havoc in the Atlantic Ocean, rather than making landfall, the most recent information from the NOAA (National Oceanic and Atmospheric Association) and the National Weather Service in Philadelphia/Mt. 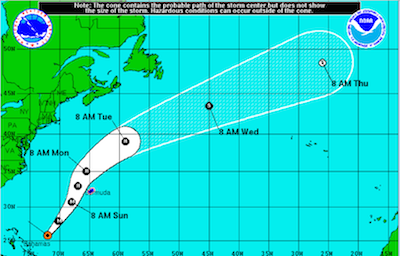 Holly NJ, shows that Hurricane Joaquin will parallel the New Jersey Coast from a distance, late Monday and through Tuesday. While Joaquin is expected to remain east, coastal flooding will occur in Delaware and New Jersey, with minor coastal flooding in the Chesapeake Bay. It will pass over the Island of Bermuda and then head out to sea, through Wednesday and Thursday, Oct.
Wind gusts during the event may range up to 45 miles per hour or more during the passage of Joaquin, along the New Jersey coastline, with some flooding through today, with some potential minor flood waters on the roadway and some minor property damage and beach erosion anticipated. At the shore area, light rain will conclude the event through the evening and nighttime hours, with a chance of precipitation overnight at 20 percent. Tomorrow, sunny skies return to the shore areas, with a high of 61 degrees, with the temperatures rising to 66 degrees on Tuesday. A chance of showers returns possibly on Friday, Oct. 9. Image courtesy of the National Weather Service. The area adjacent to the Eastern Seaboard denotes a gale warning, though the storm is anticipated to stay out at sea. Inland there should be no flooding anticipated. The forecast for Sussex County actually appears favorable over the next couple of days, with Mon., Oct. 5, returning to a high of about 62 degrees and mostly sunny, with temperatures dropping to 45 in the nighttime hours. Tuesday will be warmer, with a high of about 66 degrees, and a low of about 48 degrees. Wednesday will be about 68 degrees, with a low around 45. Thursday, forecast is still mostly sunny, around 64 degrees and dropping to about 47 on Thursday night. A chance of showers may roll in on Friday, Oct. 9. NJInsideScene.com will continue to report on this story should any further major developments occur. Stay on the scene with NJInsideScene.com. Click here to follow us on Facebook.